The object is being acted by two forces ‘mg’ and ‘Ff‘. 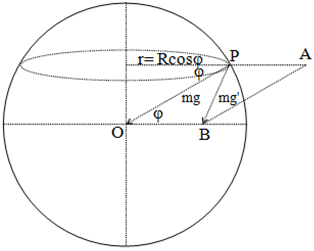 The resultant of these two forces gives the apparent weight of the object (m’g). The resultant of the two forces is given by the diagonal of the parallelogram OPAB. The value of ω is in the order of 10-4. So, the term containing ω-4is much smaller than 1 and ω2so can be neglected. 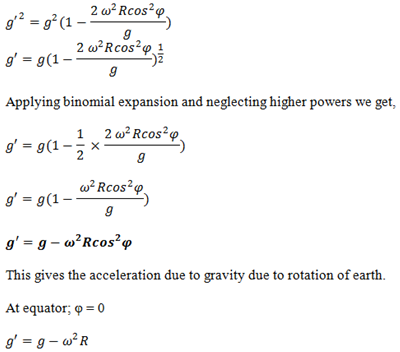 So, acceleration due to gravity is minimum at equator. So, acceleration due to gravity is maximum at poles. Hence, acceleration due to gravity decreases due to rotation while it increases due to increase in latitude.